The Old Masters knew a secret which made their paintings enduring masterpieces. Why do you think, for example, over six million people visit the Louvre every year to see the Mona Lisa? What is it about Leonardo’s masterpiece that attracts viewers like moths to a flame? The Old Masters taught this secret only to their most trusted apprentices. As a result, over the centuries, it faded into obscurity. Just a few master artists knew his secret into the eighteenth century. The modern art movement scorned these time-tested principles. As a result, artists lost access to these proven principles. Only within the few decades have master artists begun teaching these secrets again. These secrets, by the way, have nothing to do with new paint formulas or mediums. They aren’t about new brushes and tools. The reason is that this secret is not about how you apply paint to the canvas at all. This secret is what you do before you place your canvas on the easel. First, though, a little background. Art Historians credit John Thomas Smith with creating the “Rule of Thirds.” In 1797 Smith misinterpreted a statement from an earlier painter Joshua Reynolds. Reynolds, a portrait painter, wrote about the juxtaposition of values in a work of art. Smith took Reynolds statement and simplified it. He wrote that an artist should divide a painting into thirds. 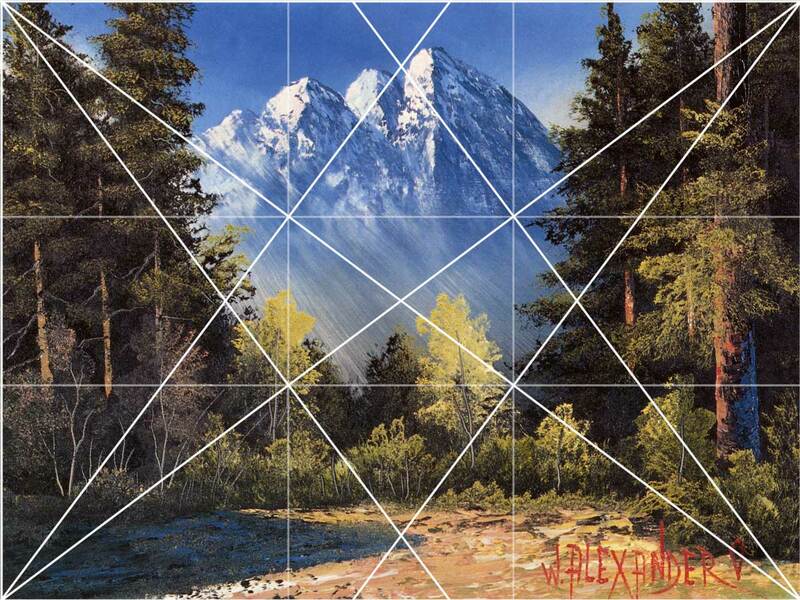 For example, here is Bill’s painting “Sunlight” as it would appear according to the Rule of Thirds. As you can see, there is some validity to the Smith’s rule. Look how Bill positioned the objects in “Sunlight.” There is a balance and an even distribution of weight throughout the painting. The problem is the Rule of Thirds misses out on more that’s going on in the painting. At best, the Rule of Thirds is a beginner’s introduction to the secret of the Old Masters. When we look at “Sunlight” at a more advanced level, we see something entirely different. The addition of diagonal lines now gives the same image dynamic action. At the same time, the painting still maintains balance and weight within the image. One final set of diagonals accentuates other objects in the painting. For example, look at how the diagonal lines track the perspective of the objects. Tom Anderson, the instructor of Master Class, coined a term “The Atmospheric Dome.” In “Sunlight” the Atmospheric Dome is under the mountain in the center of the painting. The diagonal lines help move the eye toward the center of the painting. They also help draw attention to the sunlight effect in the lower right of the painting. In Master Class, we use the Rule of Thirds to introduce the Old Master secret to our students. If you want to take your art skills to the next level, then Master Class might be your ticket to artistic excellence. If you’d like to learn more, click the link below, or call Dawn at (360) 686-1102. Here’s the link to information on Master Class.